Longstone View ,Cottage ,has a lovely lounge with comfortable suite glowing log burning stove,Internet access (Wifi), Satellite TV and DVD. A super dining kitchen with quality units, table and chairs, cooker, microwave and fridge/freezer. A utility room with sink and automatic washer. A delightful double bedroom under the eaves with breath - taking views across the valley. An en-suite shower room with shower and W.C. A super twin bedroom of matching quality. A beautifully tiled modern bathroom with bath/shower over and W.C. Linen and towels are provided. Central heating, power and an initial supply of fuel for the stove are included. There is an attractive little front patio garden and rear stone flagged courtyard both with furniture. Dedicated parking for one car is available close to the cottage together with other spaces on the quiet road adjacent. There is secure storage for bikes. Pets and smoking are not permitted. Access for people with disabilities may be difficult. To check availability please view via tab at top of page. Our normal changeover day is Saturday. We do short breaks normally in off peak times and normally a minimum of 3 days. The changeover day for short breaks can be varied depending on requirements. If you require more days than this please contact us direct on the "Enquire now" tab for our best price. The owners are Richard and Christine who bought the cottage in a delapidated state and have lovingly restored it to its former glory. The cottage has all the modern facilities but maintains its original character with sloping ceilings, narrow stairs ,oak beams and original quarry tiled floor. Bakewell is the jewel in the crown of the Peak National park. It is ideally located in the middle of the park making all areas easily accessible. There is always something going off in Bakewell whether it be Bakewell show or one of the speciality or farmers markets. Chatsworth House and Haddon Hall are both close by and both are well worth visiting. If the weather is not good for walking then the shops,pubs and restaurants in Bakewell give you an alternative day out and an excuse to sample the Bakewell pudding!! A lovely lounge with comfortable suite glowing log burning stove,Flat screen T.V.,with satellite channels and DVD. A super dining kitchen with quality units, table and chairs, cooker, microwave and fridge/freezer. Bakewell Golf Course 1.3 miles from Property. Approx 4 minutes to drive by car. 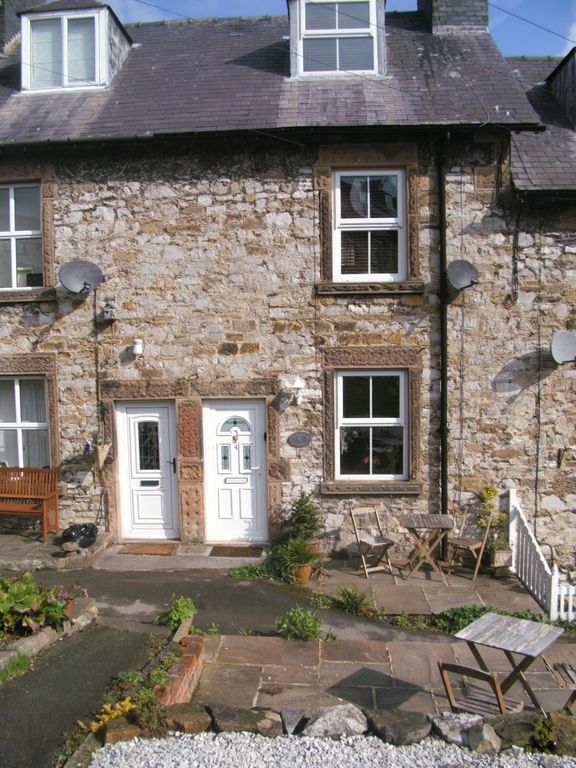 A well equipped cottage conversion with dedicated parking space. Walking distance of town centre. We enjoyed our stay in the cottage which is well equipped. In a tourist centre, it was good to have an allocated off-road parking space. The cottage is in a quiet location within walking distance of the town centre ( a bit steep walking back!). It made a good base for exploring the area. We visited Bakewell, Buxton and Derby. We also walked the Monsal Trail including viaduct and tunnels. We visited Speedwell Cavern, Peak Cavern and Peveril Castle. Bolsover Castle also made a very interesting contrast. With a longer trip we could have also included Chatsworth, Haddon Hall and Hardwick Hall. There are a lot of fish and chip restaurants and we found Charles at Matlock Bath excellent. Great place to stay. We were there over New Year. Warm and cosy with the log burner and great views and walks into Bakewell (5 minutes downhill a bit more coming back) and surrounding countryside. Good instructions from owner. Had a great time. Fab cottage in the perfect location with great views over the town. Cottage very clean and well furnished, home from home. Longstone View has everything you need. Parking space is an added bonus with a short walk to town. Would recommend and will stay again. Thank you for your lovely review .We are so pleased that you enjoyed the Peaks and your stay in our cottage. You are most welcome anytime. It was a very nice property parking etc.had all that we needed . All was positive about the cottage, except remain double bed, we both slept really badly in it all week. the bed frame and the mattress could play a tune, it was like sleeping in a bouncy castle, one moved the other woke up. think the springs have died. please oil the bed frame to stop it squeaking and invest in a decent mattress. apart from that we had a lovely stay. thank you. You were perfect guests and are welcome back anytime. We had a great few days over our October half term. Knowing that the weather can be unpredictable, we wanted somewhere that was well-placed for walks on good days but also had the potential for pottering around shops on not-so-good days. This cottage is perfect for that. We were able to leave the car in the designated parking space (always a bonus!) and take any number of walks (including a lovely round trip to Haddon Hall and back via Over Haddon) straight from the cottage door. Chatsworth is a short drive away, as is Matlock Bath. Of an evening (and on the rainy day!) we took the path into Bakewell itself for a potter (only a 5 minute walk, albeit longer on the way back after having eaten - it's quite steep!!). The cottage itself has great views across Bakewell and the Derbyshire countryside, is beautifully furnished and benefits from having 2 bathrooms. We felt at home! I'd wholeheartedly recommend it if you're looking for a stay in the heart of Derbyshire. Bakewell is approximately 30 minutes drive from junction 29 on the M1. Bakewell has an abundance of cafes ,restaurants and pubs all offering different styles of dining. There are several well stocked supermarkets and a monday market and a regular farmers market. Booking Notes: We hold your reservation for a period of 4 working days pending receipt of your payment. A deposit of 50% of the holiday fee is required to confirm the booking with the balance due 8 weeks before the start of your holiday. Full payment is required if the booking is within 8 weeks of your holiday. We reserve the right to cancel the holiday where full payment has not been .received by that date. If you wish to pay by Bank Transfer please contact us for details. Changeover Day: The changeover day is Saturday and arrival times is anytime after 3pm. Departure time is 10am. Notes on prices: We offer short breaks in non peak weeks please contact for details and availability.